Windows is both a way of presenting applications and commands on the computer screen graphically in rectangles or windows, and the name for the Microsoft computer operating system that uses this method. I usually distinguish between the two by using capital W for Microsoft Windows. Most people will use a version of Windows (the operating system) issued in or after 1995. There is an older version, Windows 3.1, with a very different screen layout. On a networked computer, like those in colleges and schools, you may start Windows from a menu, or you may have to enter a username and password before it starts. If you have a computer at home with Windows 95 or a later version on, you usually have no choice. Windows just starts when you switch your computer on. If you have a computer at home with Windows 3.1 on, you will have a black screen when you first switch on. You will probably type win and press to start Windows. From the users's point of view an operating system is an environment. It is the overall software that holds all the other pieces of software together. In a Windows Operating System you use menus from the Start Button or icons in program manager to get to the wordprocessor, internet browser, email mailer or whatever else you want to use. With Windows 95 onwards you usually start from a green screen with small stacks of oblongs, like trays, in the corner. You use the Start Button to get to menus of the things you can do. 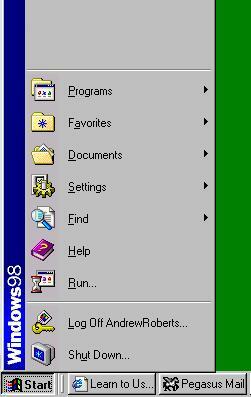 If you are using Windows 3.1 or 3.11, you use the Windows Program Manager This is a big window that controls all the rest. The title at the top of the screen should be Program Manager and there should be just a short list of menu items: perhaps just File, Options, Window, and Help. If the bottom of your computer screen has a strip like the one above, it is the Task Bar. You use this to start different tasks. The picture in the left corner is the Start Button. Click on this and a menu of choices should spring up. The area I have shown in grey at the top can have different menu items inserted. If you are using a computer in a University or Company, it is likely to have menus of programs that are of special value to you. If you are using your own computer it is likely to have picture icons in it put there by software you have installed. On you home computer, you will probably use the Programs menu to start programs. When a program is running on your computer, it will be shown on the task bar at the bottom. This picture shows Internet Explorer and Pegasus running on mine. Clicking on these task bar buttons would display the program windows on the screen. Applications designed for Windows have a screen layout that has common features with all other Windows applications. mouse commands. You can control Windows with strokes on the keyboard, but it is designed to be controlled intuitively by your clicking on pictures and other graphical devices, using the mouse. windows. The windows are rectangles on the screen containing sets of icons that represent applications, or an open application. You can have several applications open at once. icons. The icons that represent applications are small pictures or symbols with the name of the application underneath. pull-down menus. At the top of the screen there are bars or strips with words and symbols on. The strip (usually white) with just words on is the menu bar. At the left of the bar there should be the word "Help". If you click on any word on this bar you will get a pull down menu of commands you can use by clicking on the one you want to try. toolbars. Toolbars are rows of buttons with pictures (icons) on that illustrate what they do. They save you pulling down a menu for some things that you do often. For example, a pull down menu called tools may have an item called spell check. The toolbar may have a button marked ABC. Clicking on either will start the spell check. To find out what a picture button does, you point the mouse to the button, without clicking. A descriptive label will appear by the mouse pointer. A longer description may appear at the top of the screen. on screen help. There are hefty paper guides to Windows that you can read, but Windows is designed to let you find out how it works by poking about with your mouse on the screen. If you click on the menu item Help < in any Windows application you will bring a computer guide to your screen that is about the application you are using. Often the page opened will be about what you are just trying to do. How to learn basic Windows skills. The best way to learn about Windows is by playing with it. The learning how to use computers page will tell you about applications you can play with and tutorials you can use. Many of the following keystrokes are used to switch between different programs. What they do varies between different versions of Windows, so you should try them on yours. CONTROL/ESCAPE brings a Task List to the screen. This shows all the programs you have running. If you press the keys marked Control and Esc (both together) now, you should see your list. These programs are all running at once and I can display them in small windows (so that I see them all at once) or full screen (so that I have to switch from one to another with keys). Netscape is highlighted at the moment, because I am reading this page in a Netscape browser. By moving the highlight up or down the list with the arrow keys I can choose another program I want to use. When I have chosen it I press ENTER. I move to the other program, but Netscape remains running in the background. You should be able to do this with your list. You may want to start a few more programs if there are not many running. ALT/TAB will also switch between the programs that you have running. Keep your thumb on ALT and press TAB. Each time you press TAB the title of one of the programs comes up. When you release the key you have moved to the new program. ALT/ESCAPE has a similar effect to ALT/TAB, but the whole program comes up, instead of just a title. F1 usually gets a help program for you. CONTROL/A will often select or block all the text in a document that you have opened. By this means you may be able to block the whole of an email, for example, before copying it. CONTROL/V will usually paste text that is in the clipboard to the point where your cursor is. ESC (ESCAPE) will sometimes get you out of something. For example, if a notice appears on screen that you cannot do anything about. CONTROL/Z will often undo the last thing that you did in a wordprocessor or similar program. ALT/F4 will exit a program. It will usually ask you if you want to save any changes you have made to a file. You can also exit Windows with this keystroke. CONTROL/F4 will close a document or dialogue box in a program. CONTROL/ALT/DELETE pressed all at once are the keys you press if you think the program you are working on has completely frozen. They are a last resort. You will lose material that has not been saved.